Canola plants damaged by herbicide residues in the soil can be stunted only slightly and make full recoveries. Or they can be delayed significantly and even killed. In the case of Group 14 carryover, death can occur at the seedling stage. For Groups 2 and 4, plants may start off looking healthy but deteriorate over time. Herbicide carryover damage can be spotty, even showing differences plant to plant, so if enough plants survive, patiently waiting may be the best move. However if large areas are dead or stunted or delayed, reseeding may be required. Will damaged plants die? This can be a tough question to answer with herbicide carryover damage. Plants can take weeks to die. Or they may live, but be severely stunted and possibly not flower. 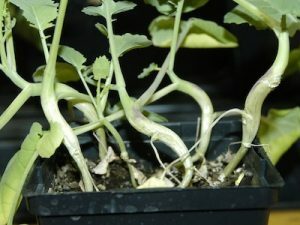 The safe bet may be to assume that severely damaged plants will not be productive, even if they show signs of life at the moment. If the result is fewer than 2 healthy plants per square foot, reseeding may be the best choice in May. In mid June, crop insurance reseeding options may be limited and leaving the crop may be the best choice. Will the reseeded crop be equally affected? If reseeding to the same crop and same HT system, yes, it could be. The safe bet would be to reseed to a crop with tolerance to the herbicide group in question. Group 2: Canola is highly sensitive to Group 2 carryover. Symptoms include purpling, chlorosis (yellowing) and stunting. Reduced leaf size and elongated and/or thickened leaf petioles are signs. In severe cases, these symptoms are combined with very slow plant growth and minimal recovery over time. Severe cases can also cause deformity at the growing point. Symptoms can persist for weeks. Group 2 damage to canola. 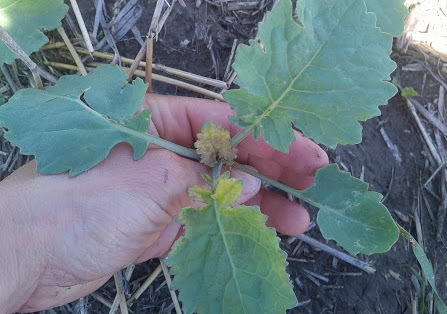 Group 4: Canola plant growth may start normal, but as the plant takes up residual Group 4 herbicide, it can cause clear deformity of new leaves and stems. Abnormal growth can include twisted stems, callused stems, cupped deformed leaves and the development of deformed tissues and secondary roots. 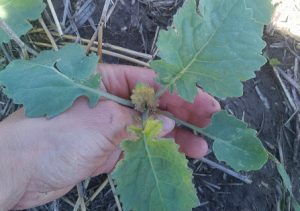 Group 4 damage to canola. Group 5: Symptoms can include wilting and yellowing of oldest leaves. Group 14: While Group 14 carfentrazone can be applied pre-seed ahead of canola, Group 14 saflufenacil (Heat) cannot be. Symptoms of Heat damage to canola are yellow and desiccated leaves, and bleached seedlings. Seedlings usually die prior to or shortly after emergence. Patterns of damage that follow distinct lines in a field indicate a machinery-related issue. To diagnose sprayer tank contamination, look for clear distinctions between sprayer passes as first passes may be worse than subsequent passes as the contamination washes out of hoses and nozzles. Plants within missed areas or at headlands where passes overlapped can provide further evidence. Note that damage that follows distinct lines could also be seeder related, perhaps due to seed depth or even seed-placed fertilizer. If several tank-fills are contaminated, look for differences in damage after refilling or stopping the sprayer for lunch or overnight. Plant damage from spray tank contamination is usually much more predictable than damage from residual product carryover in the soil. If plants are recovering within a week or so of the sprayer mishap, the crop is likely OK. That same assurance is not possible with carryover in the soil. Damage could continue to get worse. All bets are off as too many factors play into potential crop recovery to predict crop survival or yield potential. 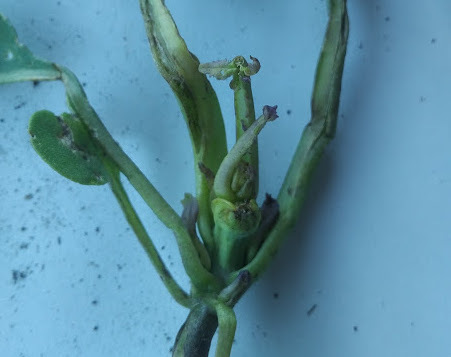 Cold stress can cause purpling and leaf cupping, but in this situation, symptoms may occur more generally across a field and will go away shortly after temperatures warm up and plants start actively growing again. Sulphur deficiency can cause cupping, purpling and chlorosis (yellowing) of plant tissue. Sulphur deficiency rarely occurs early in the season as sulphur uptake is not high in these first weeks. Boron deficiency (and toxicity) can also cause cupping.